Since then, researchers have proposed many techniques to improve NMT, including work on handling rare words by mimicking an external alignment model , using attention to align input words and output words  and breaking words into smaller units to cope with rare words [5,6]. Despite these improvements, NMT wasn't fast or accurate enough to be used in a production system, such as Google Translate. Our new paper  describes how we overcame the many challenges to make NMT work on very large data sets and built a system that is sufficiently fast and accurate enough to provide better translations for Google’s users and services. Data from side-by-side evaluations, where human raters compare the quality of translations for a given source sentence. Scores range from 0 to 6, with 0 meaning “completely nonsense translation”, and 6 meaning “perfect translation." The following visualization shows the progression of GNMT as it translates a Chinese sentence to English. First, the network encodes the Chinese words as a list of vectors, where each vector represents the meaning of all words read so far (“Encoder”). Once the entire sentence is read, the decoder begins, generating the English sentence one word at a time (“Decoder”). To generate the translated word at each step, the decoder pays attention to a weighted distribution over the encoded Chinese vectors most relevant to generate the English word (“Attention”; the blue link transparency represents how much the decoder pays attention to an encoded word). Using human-rated side-by-side comparison as a metric, the GNMT system produces translations that are vastly improved compared to the previous phrase-based production system. 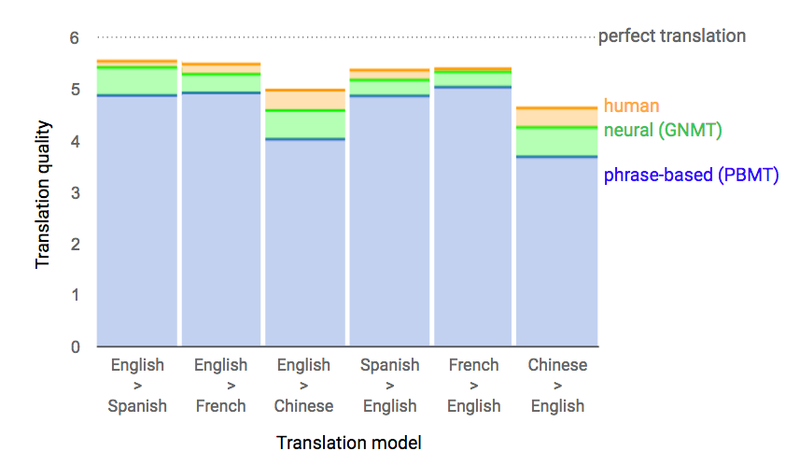 GNMT reduces translation errors by more than 55%-85% on several major language pairs measured on sampled sentences from Wikipedia and news websites with the help of bilingual human raters. An example of a translation produced by our system for an input sentence sampled from a news site. Go here for more examples of translations for input sentences sampled randomly from news sites and books. In addition to releasing this research paper today, we are announcing the launch of GNMT in production on a notoriously difficult language pair: Chinese to English. The Google Translate mobile and web apps are now using GNMT for 100% of machine translations from Chinese to English—about 18 million translations per day. The production deployment of GNMT was made possible by use of our publicly available machine learning toolkit TensorFlow and our Tensor Processing Units (TPUs), which provide sufficient computational power to deploy these powerful GNMT models while meeting the stringent latency requirements of the Google Translate product. Translating from Chinese to English is one of the more than 10,000 language pairs supported by Google Translate, and we will be working to roll out GNMT to many more of these over the coming months. Machine translation is by no means solved. GNMT can still make significant errors that a human translator would never make, like dropping words and mistranslating proper names or rare terms, and translating sentences in isolation rather than considering the context of the paragraph or page. There is still a lot of work we can do to serve our users better. However, GNMT represents a significant milestone. We would like to celebrate it with the many researchers and engineers—both within Google and the wider community—who have contributed to this direction of research in the past few years. We thank members of the Google Brain team and the Google Translate team for the help with the project. We thank Nikhil Thorat and the Big Picture team for the visualization. Sequence to Sequence Learning with Neural Networks, Ilya Sutskever, Oriol Vinyals, Quoc V. Le. Advances in Neural Information Processing Systems, 2014. Addressing the rare word problem in neural machine translation, Minh-Thang Luong, Ilya Sutskever, Quoc V. Le, Oriol Vinyals, and Wojciech Zaremba. Proceedings of the 53th Annual Meeting of the Association for Computational Linguistics, 2015. Neural Machine Translation by Jointly Learning to Align and Translate, Dzmitry Bahdanau, Kyunghyun Cho, Yoshua Bengio. International Conference on Learning Representations, 2015. Japanese and Korean voice search, Mike Schuster, and Kaisuke Nakajima. IEEE International Conference on Acoustics, Speech and Signal Processing, 2012. Neural Machine Translation of Rare Words with Subword Units, Rico Sennrich, Barry Haddow, Alexandra Birch. Proceedings of the 54th Annual Meeting of the Association for Computational Linguistics, 2016.